Population growth refers to change in the size of a population—which can be either positive or negative—over time, depending on the balance of births and deaths. If there are many deaths, the world's population will grow very slowly or can even decline. Population growth is measured in both absolute and relative terms. Absolute growth is the difference in numbers between a population over time; for example, in 1950 the world's population was 4 billion, and in 2000 it was 6 billion, a growth of 2 billion. Relative growth is usually expressed as a rate or a percentage; for example, in 2000 the rate of global population growth was 1.4 percent (or 14 per 1,000). For every 1,000 people in the world, 14 more are being added per year. For the world as a whole, population grows to the extent that the number or rate of births exceeds the number or rate of deaths. The difference between these numbers (or rates) is termed "natural increase" (or "natural decrease" if deaths exceed births). For example, in 2000 there were 22 births per 1,000 population (the number of births per 1,000 population is termed the "crude birth rate") and 9 deaths per 1,000 population (the "crude death rate"). This difference accounts for the 2000 population growth rate of 14 per 1,000, which is also the rate of natural increase. In absolute numbers, this means that approximately 78 million people—or about the population of the Philippines—are added to the world each year. For countries, regions, states, and so on, population growth results from a combination of natural increase and migration flows. The rate of natural increase is equivalent to the rate of population growth only for the world as a whole and for any smaller geographical units that experience no migration. Populations can grow at an exponential rate, just as compound interest accumulates in a bank account. One way to assess the growth potential of a population is to calculate its doubling time—the number of years it will take for a population to double in size, assuming the current rate of population growth remains unchanged. This is done by applying the "rule of seventy"; that is, seventy divided by the current population growth rate (in percent per year). The 1.4 percent global population growth rate in 2000 translates into a doubling time (if the growth rate remains constant) of fifty-one years. 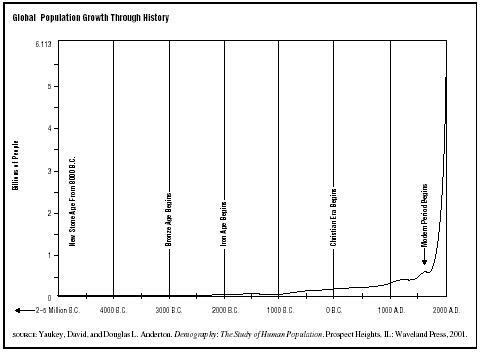 As can be seen in Figure 1, the world's population grew very slowly until about 1750. There was a long period of stationary growth (no growth) until 1000 B.C.E. , when the world's population was approximately 300 million; this was followed by a period of slow growth from 1000 B.C.E. to approximately 1750, at which time global population was an estimated 800 million. Until this time, the world's population was kept in check by high death rates, which were due to the combined effects of plagues, famines, unsanitary living conditions, and general poverty. After 1750, the world's population grew substantially; by 1950 it had tripled to around 2.5 billion. In this 200-year period, the doubling time was 122 years. Growth from 1950 to 1985 was even more dramatic; by 1985, the human population was 5 billion. World population had doubled in thirty-five years. By 2000 global population was 6 billion and is projected to be 9 billion in 2050. Population growth did not become exponential until around 1750. Before that, high mortality counterbalanced the high fertility needed by agrarian parents. Death rates were high and life expectancy was low; life expectancy at birth was in the range of twenty to forty years (most likely around thirty years) until the middle of the eighteenth century. This high mortality was a function of several factors, including poor nutrition, which led directly to deaths through starvation and indirectly through increasing susceptibility to disease; epidemics; and, quite possibly, infanticide and geronticide, especially during times of food shortage. Starting in the middle of the eighteenth century, the mortality rate began to decline in the West, the first place in the world where the natural balance between births and deaths was altered by humans. This decline in deaths occurred not because of major medical breakthroughs (e.g., penicillin was first used only in the 1940s) but rather because of improvements in food availability, housing, water cleanliness, personal hygiene, and public sanitation. Later, in the twentieth century, medical advances, particularly vaccinations against infectious diseases, accelerated mortality decline. Western mortality decline was relatively slow, paralleling socioeconomic development, and it occurred in a global context in which European population "surplus" (arising from gaps between lowering mortality and more slowly lowering fertility) was able to migrate to new areas (e.g., the United States, Canada, and Australia) that were very sparsely populated by Aboriginal peoples (whose numbers were reduced even more by contagious diseases brought by Europeans). Mortality decline in less developed countries followed a different path. First, mortality decreases did not begin until around 1950, much later than in the West. Second, in many less developed countries, substantial mortality reductions occurred in a short period of time. A classic example is Ceylon (now Sri Lanka), where the death rate was halved in less than a decade, starting in the early 1950s. (In the West, a comparable reduction typically took around one century.) In these less developed countries, mortality decreases were not matched by fertility decreases, where they produce population growth rates much greater than those experienced in the West. So the demographic transition that took two centuries to unfold in the West occurred (or is occurring) within the span of a single life. Third, mortality decline did not parallel economic development. Rather, the impetus behind third world mortality reductions originated, for the most part, in factors external to the society. For example, the speedy mortality decline in Ceylon was due to the importation of American technology (pesticides and the airplanes for spraying them) that killed the mosquitoes that were responsible for malaria, the leading cause of death. During the cold war, it was not uncommon for the United States to provide nonaligned countries with such assistance in the hopes of wooing them away from the Soviet Union and a communist development model. As a result, the world witnessed unprecedented rapid population growth between 1950 and 1985, owing, in large part, to third world increases. Further, the phenomenal increase in human numbers over the past 250 years is largely the consequence of mortality declines—not fertility increases. The first deaths to be reduced were those due to infectious diseases, the victims of which were most often children. The old killers of the past were to be replaced by chronic and degenerative diseases; the primary victims shifted from the young to the old. 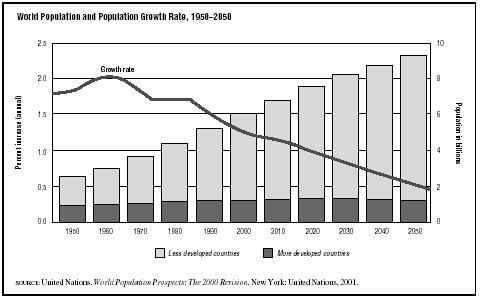 The rate of global population growth has declined significantly from its 1970s highs (see Figure 2). Current estimates anticipate a continued decline to about 0.5 percent in 2050. This corresponds to a doubling time of 140 years, a rate that has fostered concern about how the world will cope with 18 billion people in 2190. It is in the less developed countries that the continued growth in population will occur in the twenty-first century. Even though mortality is much higher in less developed countries (e.g., life expectancy at birth in 2000 was 75 years in the more developed countries and 62 to 64 years in the less developed countries), fertility remains even higher, thus accounting for relatively high growth in the third world. However, projections are not guarantees. Population may grow more slowly if, optimistically, fertility declines more quickly than experts expect (e.g., between just 1965 and 1987 the average number of children born to Thai women dropped from 6.3 to 2.2) or, pessimistically, if mortality increases, especially in light of the persistence of HIV/AIDS pandemic and other communicable diseases. While theories about population growth first appeared in ancient Greece, the English clergyman and economist Thomas Malthus (1766–1834) is considered to be the pioneering theorist of the modern age. Malthus formulated a "principle of population" that held that unchecked population grows more quickly than the means of subsistence (food and resources) to sustain it. Population will be controlled either by preventive checks (lowering the number of births, particularly by postponement of marriage age) or by positive checks (increasing deaths as a result of famines, plagues, natural disasters, war). Given a morally based preference for preventive checks, later followers of Malthus (neo-Malthusians) have supported family planning and contraception even though Malthus himself felt that contraception was unacceptable. Other neo-Malthusians have focused upon the claimed negative effects of rapid population growth: war, violence, and environmental degradation. Karl Marx's views on population were directly opposed to those of Malthus. Marx disagreed with the Malthusian idea of a universal principle of population that applied to all societies. For Marx, population growth depended upon the economic base of society. Thus, capitalist society is characterized by its own population principle, which Marx termed the "law of relative population surplus." He argued that capitalism creates overpopulation (i.e., a surplus of people relative to jobs), leading to increased unemployment, cheap labor, and poverty. Also, capitalism requires unemployment in order to ensure a docile, low-paid class of laborers. Marx envisioned that overpopulation would not occur in postcapitalist, communist society. In the middle of the twentieth century, demographic transition theory became the dominant theory of population growth. Based on observed trends in Western European societies, it argues that populations go through three stages in their transition to a modern pattern. Stage One (pretransition) is characterized by low or no growth, and high fertility is counterbalanced by high mortality. In Stage Two (the stage of transition), mortality rates begin to decline, and the population grows at a rapid pace. By the end of this stage, fertility has begun to decline as well. However, because mortality decline had a head start, the death rate remains lower than the birth rate, and the population continues to experience a high rate of growth. In Stage Three (posttransition), the movement to low fertility and mortality rates is complete, producing once again a no-growth situation. The theory of demographic transition explains these three stages in terms of economic development, namely industrialization and urbanization. Since about 1980, demographic transition theory has been criticized on a number of grounds, including its assumption that the demographic experience of non-Western societies will inevitably follow that of the West; its failure to consider cultural variables; and its hypothesized relationship between population growth and economic development. Indeed, all three theories above contain assumptions about population growth and economic development; however, there is mounting evidence that this relationship is complex and varies from context to context. As the twenty-first century begins, the attempt to erect a general theory of population growth has been abandoned, signaling for some an alarming trend in population studies. Brown, Lester R., Gary T. Gardner, and Brian Halweil. Beyond Malthus: Nineteen Dimensions of the Population Challenge. New York: W. W. Norton, 1999. Coale, Ansley J. "The History of the Human Population." Scientific American 231 (1974):40–51. Ehrlich, Paul R., and Anne H. Erhlich. The Population Explosion. New York: Simon and Schuster, 1990. Furedi, Frank. Population and Development: A Critical Introduction. Cambridge, England: Polity Press, 1997. Homer-Dixon, Thomas. Environment, Scarcity, and Violence. Princeton, NJ: Princeton University Press, 1999. Keyfitz, Nathan. "Population Theory and Doctrine: A Historical Survey." In Alex Inkeles and Masamichi Sasaki eds., Comparing Nations and Cultures: Readings in a Cross-Disciplinary Perspective. Englewood Cliffs, NJ: Prentice-Hall, 1996. Livi-Bacci, Massimo. Population and Nutrition: An Essay on European Demographic History. Cambridge: Cambridge University Press, 1991. McKeown, Thomas. The Origins of Human Disease. Oxford: Basil Blackwell, 1988. Overbeek, Johannes. History of Population Theories. Rotterdam, Netherlands: Rotterdam University Press, 1974. Petersen, William. From Birth to Death: A Consumer's Guide to Population Studies. New Brunswick, NJ: Transaction Publishers, 2000. Population Reference Bureau. World Population Data Sheet, 2000. Washington, DC: Author, 2000. United Nations. Population Growth, Structure and Distribution: The Concise Report. New York: United Nations, Department of Economic and Social Affairs, 1999.
thanks for your discussion to the world wide sensitisation on population growth please continue with that excellent work. it was a nice article....n its help a lot to me in my assignment.